This is a generally well plotted finale and there is a great spear sequence included. How often do we get the chance to see Chan (late in his career) working with real chinese weapons, especialy the three sectioned staff? Think to yourself, how could I have a 3 minute action sequence take place in the back of a van, and for the heck of it, throw in a recurring comedic gag without ruining the sequence? Great use of seat cushions, emergency brakes, and kicking people out of doors here turns what could've been a run of the mill sequence into something tight, fast, and fun to watch. Great to see Sammo Hung (who directed this film) get a little comedic cameo on the side. While the film itself was a mixed result, this was the best action sequence to come out of it. It's actually a rare one on one fight for Jackie and one that features a lot of leg work, another rare occasion. Jackie's been in better fights, but this one stands out in particular because of the bright and memorable Lego setting. There are also a couple great choreographed beats as well. I think these sequences are Chan's bread and butter. When Chan is able to mix his martial arts with an interesting environment and opponent that allows him to come up with visual gags and running themes, he seems to always be able to produce. I love the ever decreasing book sizes as well as the reverse situation of artifacts we found in the Rush Hour finale sequence. One of few standout racing scenes in Thunderbolt this is a authentically filmed night race. Incredible night footage of two cars going fast and doing some great stunts. One thing you'll notice in each of Chan's car chase scenes is that he understands these sequences need several beats or punctuated moments of action. Many filmmakers think two cars just racing or chasing are enough, but see how Jackie plots the chase well providing certain 'moments' of stunt work with a finale ending. Another bread and butter genre for Chan and this is one that few martial artists have even tried. It's not just a chance for action, but one for Chan to show off the myriad of talents that he has. Chan treats his chase sequences just like his car chase sequences. His chases are filled with beats and stunts and usually are always capped off by a particularly incredible stunt. This one is no different. There are a couple incredibly close run ins with vehicles and a jumping stunt (really done) to top it off. Only Tony Jaa in the first Ong Bak has used this style of sequence to it's potential. This is an unusually strong sequence for Chan, I don't mean that in quality, I mean that in intensity. It's rare he basically manhandles a group in a fight, but this is one of those rare scenes. Also different in this scene is the lack of Chan's usual camera work. Instead of master shots, this is more tightly cut and dynamic. Proof that Chan could be successful even outside his comfort zone. Another example of Chan's early fast and intricate work from The Young Master. Notice how this scene is all about Chan showing off how he can arm himself while disarming his opponents. Fast, complicated, and extremely impressive. I've always viewed Chan's 1987 Armor of God and the follow-up 1991's Operation Condor to be his general take on a Bond film. So this to me, is what a car chase sequence in Chan's version of James Bond would look like. 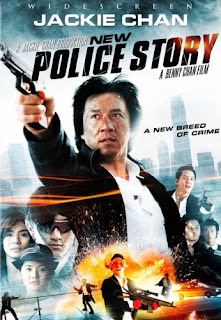 While it's got the usual stunt beats I've mentioned before, the big difference to me between Hollywood car chases and Chan's version is the way Chan approaches filming his stunts. Hollywood likes to get up close and favors a more visceral appeal. Chan likes to show off the size, destruction and danger of his stunts, so his camera sits far away. Different styles, different outcomes.